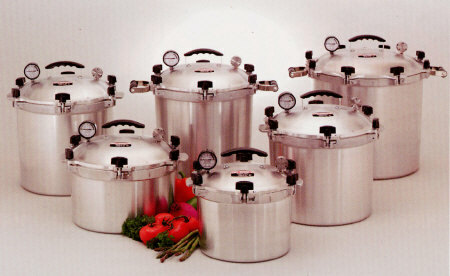 Pressure canning is the only method considered safe for low acid foods by the USDA. The superb craftsmanship of these tough cast aluminum cookers allows a steam tight metal to metal seal with no gasket to warp or crack. 250 degrees at 15lb per square inch guarantees bacteria kill. Easy on-off cover. Positive action clamping wing nuts permit easy open and close. Equipped with two automatic venting features, safety control valve and overpressure plug . Includes cooking canning rack and instructions.